After some long discussions about strike indicator fly fishing and wanting to create the perfect presentation for certain fly fishers and situations, I sat down with Bob, a dear friend and fly fishing guru. After offering me some interesting ideas about this, I went out and experimented, tweaked and came up with “The Bob B Mendicator System ”, a fly fishing indicator technique which has proven to be possibly the most effective way to use strike indicators since their creation. Notice I said indicators. “Achieving the same presentations and success as the center-pinners get. Keeping this simple, I use and instruct this method with clients and seminar attendees for both effective nymphing while helping them have better line control while mending to a perfect presentation. Best suited for this indicator method. 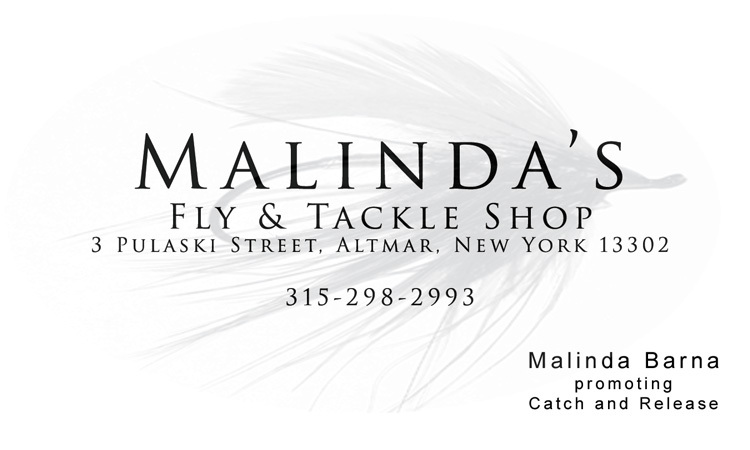 ask for Walt’s “Bob B Mendicator System at Malinda’s Fly Shop in Altmar NY. for longer drifts are suggested to achieve the best performances for this method and any other techniques needed to extend mending and reach casting. Korkies are balsa, football shaped floats, available in many sizes with durable finishes of highly visible indicator colors. Other football shaped indicators will suffice. I recommend three sizes to be used with the or similar greased floating leaders. Long belly salmon, steelhead and trout tapered floating fly lines offer easier line control, further mends and easier roll casing for this technique. Slip on football shaped foam indicators work well also, especially within forty feet and closer. They are easier to make length adjsutments on the leader and easy to remove, but I find the korkies will cast better for longer distances. Depending on water conditions added b or bb weight may be substituted with weighted or bead head flys. Adjustments and experimentations must be made to put the fly into the strike zone. Smoother water may require only a couple of b’s or one bb and use the smaller and mid sized Korkies. For heavy conditions I recommend the middle and larger Korkies. The Korkie closet to the fly is the "striker" and the other, above or closest to the fly line is the "Mendicator". It’s easy, set the hook on any movement on the striker and do your mending to the mendicator which in most all conditions must be kept above the striker while floating down stream. 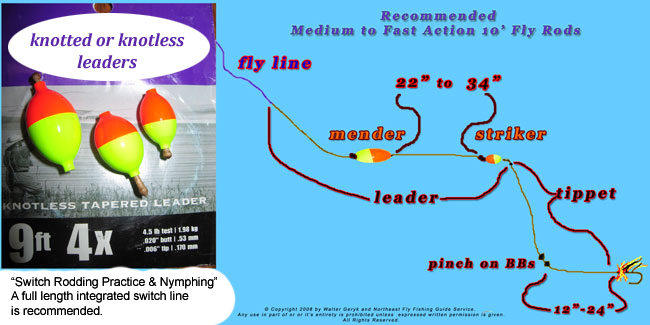 By mending and controlling the fly line to the mendicator, this allows: one (slow down your presentation), two (eliminate all tugging on the striker, which cause an un-natural drift), three (allows for set up time and better presentations in difficult to get to and drift areas) four, (slow down the surface current drag while presenting near perfect drifts in the much slower deeper currents) and more applications when you become comfortable using the “Bob B Mendicator System ”. Again easy, while casting be sure you allow the Korkies to straighten, both on the back and forward casts. When they’re on the water, immediately throw a hard roll cast to re-align the korkies into the fishing presentation (striker down stream of the upstream mender). This method will also make you a better line mender for other applications such as my “Vertical Tip Method”(a bit more complex timing & casting ), “Slack Line Mend” , dry fly fishing and more. Slide the tapered leader through the larger korkie first, then the smaller: for beginning and practicing, try keeping them about 18” apart help get the feel. The best results and control are achieved with longer spreads of 22” to 34". Tippet Lengths: Setting the depth is usually 1.5 X the estimated or actual depth, be sure to be in the strike zone. (example 3’ depth x 1.5 = tippet length of 4.5’) if your dragging the bottom, your too deep! Bob B Mendicator Method is designed to be casted with a fly line. give me a call to set up your time on the water. © Copyright 2004-2017 by Walter Geryk and SpeyDoctor.com. All Rights Reserved. Fly and Spey Fishermen are frequenting the Northeast and Canada for salmon, steelhead and trout with Walt Geryk and his in-depth knowledge of single and two-handed casting and fishing style. Experience Walt's unique ability to teach the technical aspects of each and every cast from the beginning to the fly presentation. Learn to recognize spey casting faults and how to easily correct them. Understand the importance of body posture and positioning as the Hardy, Fenwick, RIO, Airflo and Wulff Pro coaches you through the day. Feel the excitement of the pull and the satisfaction from the safe release of your catch. © Copyright 2004- 2017 by Walter Geryk and SpeyDoctor.com. All Rights Reserved.